You may have heard by now of multiple devices, likely related/similar to that sent to George Soros, that were discovered near the Clintons’ house and Obama’s office. October surprise? Here is the Secret Service statement.
.@realDonaldTrump with every fiber of your rotten being you‘ve incited & condoned hate. Never in 643 days have you discouraged people from unleashing the violence inside them. Your very existence requires anger & fear. You need it like normal people need oxygen. I agree with Philippe. It is also on all the morons who circulated Hillary’s home address online. I know that it is “findable,” however advertising it made it so much easier to access. It is not clear what “in the vicinity” means. (Probably for the best.) According to the statement this was a routine screening. Senior law-enforcement officials confirmed the bomb scares, including a ‘pipe with wires’ mailed to CNN‘s headquarters in New York. U.S Secret Service agents intercepted potential explosive devices on Wednesday that were addressed to president Barack Obama and former presidential candidate Hillary Clinton, the agency confirmed. As federal agents investigated the packages, authorities in New York dispatched bomb squads to the Time Warner Center in midtown Manhattan, home to CNN’s headquarters, where the building was being evacuated. Senior law-enforcement officials confirmed to The Daily Beast that a suspicious device—described as a “pipe with wires”—was found in the mailroom. A suspicious package addressed to to the Clinton’s suburban home in New York late Tuesday night and a separate parcel addressed to the Obama’s residence in Washington, D.C., were both intercepted Wednesday morning at designated checkpoints, authorities confirmed. Hillary Clinton speaks after explosive device addressed to her home was intercepted. Every day, I am grateful to the women and men of the United States Secret Service. Thank you. Thank you to the @SecretService and all law enforcement agencies who responded to this week's incidents. They work tirelessly to keep our country and communities safe. I am forever grateful for their efforts. Everyone knows that Catholics confess. Not everyone knows that, before they do, they perform an examination of conscience: a mental inventory of their sins. It is a purposeful, conscious act. But it is not the only way for the conscience to bring past failures to the surface. Conversations revisiting the past can serve that purpose. Apparently that is what happened to Jeffrey Toobin. Before posting this, I want to say that, among media personalities, Toobin is one that I found least offensive in the 2015-2016 election cycle, yet he feels some guilt. So long as President Trump continues disgracing the Oval Office, thoughtful people will probe their own role in helping him get there. No question about the attack on Clinton, responded Toobin, citing “all that bogus stuff about the Clinton Foundation” — perhaps a reference to the Uranium One story or even to the pre-election reporting of Bret Baier — later withdrawn — that there would be an indictment relating to the foundation. Perhaps it is time for other media personalities to examine their roles in the avalanche of false equivalences that preoccupied reportage during the election cycle. After all, their “normal” role is to communicate postions on issues and policies put forth by candidates. There was an imbalance to these false equivalences. Trump’s bad behavior and prejudices were right out front for all to see. Of course they merited reporting. Bells and whistles should have gone off when the negatives they reported on the other side were obscure and lacked evidence. Donald Trump was an unusually immoral candidate. Reporting his indiscretions and outrageous remarks should not have precipitated a hunt for transgressions on the other side so assiduous as to co-opt fictions being circulated by questionable sources. Their normal job should have been to question those sources and to report the excellent and extensive policies and plans Hillary Clinton was outlining at every campaign stop. It is time for all of them to examine their consciences. We can thank Jeffrey Toobin for leading the way. ICYMI Here is Hillary’s extensive interview with Anderson Cooper from Wednesday night. It could be my imagination, but it seemed to me that Hillary is more relaxed than ever. That alternate nostril breathing must really work! She clearly deliberated long and hard about this, and we respect her dedication to her Republican principles. But Christine Todd Whitman could no longer simply be #NeverTrump. She has joined the band of brave Republicans endorsing Hillary Clinton and we could not be happier to have her in our camp. Welcome, Christie! 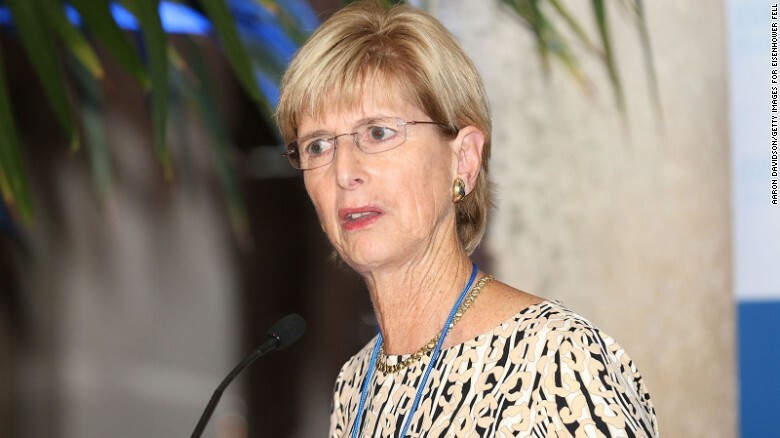 Christine Todd Whitman attends Making Strides: Advancing Women’s Leadership – Opening Reception at Vizcaya Museum & Gardens on November 17, 2015 in Miami, Florida. 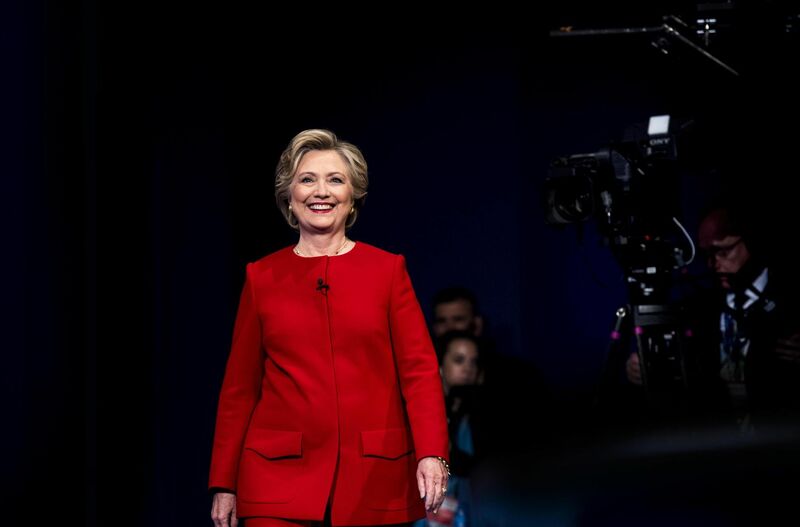 (CNN) Hillary Clinton picked up another Republican endorsement on Saturday when Christine Todd Whitman, the former governor of New Jersey, endorsed the former secretary of state. We have been waiting for this for awhile, but we knew that sooner or later Christie would team up for the best choice in this election. The Christie Bombshell … No! Not THAT Christie! Thank you, Governor Whitman! Nice to have you aboard. Bonus! The conservative Enid News has also thrown its chops behind Hillary! The reasonable choice! To paraphrase Albert Einstein, what is right is not always popular. For our newspaper — a historically conservative voice in a conservative, Republican region of arguably the reddest state in the union — endorsing a Democrat for president is truly an exception. But this is not a routine campaign. In fact, Nov. 8 will see the most crucial presidential election race in contemporary American history. Realistically, we have only two candidates for president, Donald Trump or Hillary Clinton, though other names will appear on the ballot. As has been demonstrated time and again in recent months, Trump does not have the skills, experience or temperament to hold office. For voters, Clinton is the only reasonable choice. Are you with Hillary too? Stand with her! Make a donation! CNN: WTH are you saying about Hillary Clinton??? For one thing, Joe Johns, her health is not a “major campaign issue,” although we will agree that she tends to plow forth no matter what, as you said. The diagnosis is cause, perhaps, for tweaking the schedule, but it is not a “major issue.” Hillary will follow doctor’s orders, and the campaign will roll on. Hillary, amidst a packed day on Friday, sat down with CNN’s Chris Cuomo for an interview that played throughout the day of 9/11 on CNN. Great! It was a touching and sincere interview. She was impressive. Now that Hillary’s diagnosis of pneumonia has been made public, these are the images CNN chooses to accompany the “story” of her interview and her appearance at the 9/11 ceremonies at the World Trade Center yesterday. So I need to ask WTH???? (Fifth-graders – the H stands for “heck.” Grandma S4H says that is an OK word.) Why not these pictures before she had a fainting incident yesterday and why now? She was a Senator from New York serving her constituents when these photos were taken. OH! And where is Donald Trump in the September 12, 2001 pics? Nowhere! But now that this diagnosis is out there all over the interwebs, let’s make these photos available so we can make it look like Hillary got sick long ago while serving as a Senator. There is implication in the choice to use these photos now. Shame on you, John Berman and Christine Romans. Juxtaposing these pictures with the pneumonia story creates a false narrative. As an educator, I am well aware of Gardner’s multiple intelligences. It is a theory, but I will concede that for some, perhaps for many, a visual image creates more impact than the spoken or written word. That being the case, why would a news organization pair photos of a candidate looking distressed and wearing a mask with a story about her having been found to be battling a respiratory infection? Oh wait! I know! I get it! You want to attach a deeper meaning! Somehow, going to Ground Zero (on more than one occasion) is now connected, visually, to the diagnosis which appeared, coincidentally, on 9/11. Serving her constituents made her too sick to serve. I get it. So please stop! She developed a case of pneumonia that is being treated. She has a minor incident of feeling faint. It can happen to the strongest among us. Hillary went many hours more than General Petraeus when she testified last year before the Benghazi committee without fainting. Stop trying to make Hillary Clinton look sicker and weaker than she is. Media malpractice. Very disappointing. While we’re at it, lose the snide, John Berman. It comes off like a know-it-all ninth-grader at a debate contest. Unbecoming. Hillary has seasonal allergies. See this from last year when there were 17 Republicans and she blamed her cough on Republican histamines. Many have allergies. Nothing exclusionary about that. I agree with this >>>>. Recently a friend asked if I could believe that she gets coughing fits in church. Well, yes. I can. When did a cough ever keep me out of church, school, eventually out of work? Never! That is how you keep your grades and your job. You go in sick. A cough got me my only A- in a doctoral program. The halls at Columbia might as well have been the Alps for the echoes generated. It was not the actual cough that did it. It was the fatigue. My inability to clear that highest bar that particular “bronchitis semester.” My research was sub-par – my par. I did work full-time and teach part-time throughout. Never missed a day. Could not afford to. I kept my jobs. Coughs happen. So do bronchitis and pneumonia. Hillary did, wisely, cancel a trip west. We can help her make up for the fundraisers by kicking in a few extra contributions. Let’s do this! Get well, Hillary! We love you and need you. We have the wheel for now!